The chapbooks had lots of different content; news, articles, reviews, gossip and various other fodder for people to look over. Fustercluck is kind of like that: its lack of a theme lends it more to a mini-journal of sorts but I still call it a zine. So, it wasn’t really “about” anything and I’ve continued the theme of having no theme throughout the process. If a submission strikes a chord with me and is not completely out of my scope of acceptable subjects (I won’t print racist, sexist, homophobic anything) then I mull it over, decide whether I can get some things from other people that will work well alongside it, and put it in there. The end result is a work of art in itself, on top of all the stuff inside. 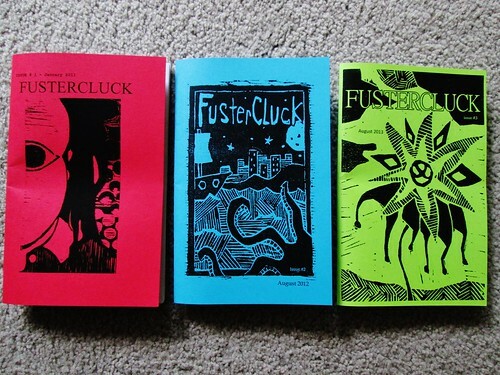 I have run Fustercluck for the past three years, only averaging one per year, so we’re at three issues now as of the end of 2013, which means a new one is one the way for LAZF 2014! The most recent issue of Fustercluck (Issue #3) is my personal favorite–I have a couple of recurring contributors but most are new to the publication and have given me some amazing work. My contributors come from all around the Bay Area and beyond; for example, the guy who does my cover, Bruce Bowman, is in Rhode Island. You can collaborate on art anywhere you are! I’ve made a lot of things zine-related or otherwise, so that’s a tough question. I guess I’d have to say a couple of my most recent paintings that I’m actually pretty proud of. The zines always give me a great feeling of accomplishment after one is created, though. Shakespeare will always be an influence on my writing and intention of becoming a writer/editor/publisher or combination of all three. Though my intention is not to live up to the mastery of Shakespeare (impossible), I am inspired by the man’s dedication to his art and the fact that he has written many of history’s best stories ever. I am influenced by almost every zine I have ever picked up. Though zine-making can be a collaborative effort, you get a pretty decent idea of the person after you read their zine. I am inspired by those who have the dedication to put out a zine in whatever way they can and am always looking at other zines for ideas and inspiration, much like an artist visits a museum before starting their next piece. My family is very influential to me. My parents are both huge readers and so their ability to read and critique the end result of what I put together is invaluable. I will always send my parents my writing for as long as they are fit to read it; they give me some of the best feedback (honest, insightful, and usually spot-on) which is necessary to putting out a decent and well-received publication. My sister included; I couldn’t have done the zine without my family encouraging me throughout. I feel as though I am a lifelong student. Currently I’ve been applying to several graduate schools so have been focused on that. Overall though, when I’m not creating, I enjoy reading most forms of literature: books, magazines, zines, etc. I enjoy baking and cooking. I know when I have too much free time, I tend to get too lost in that and don’t end up getting as much work done. I prefer a structured environment where I have time to do my art as well as maintain my desire to learn. 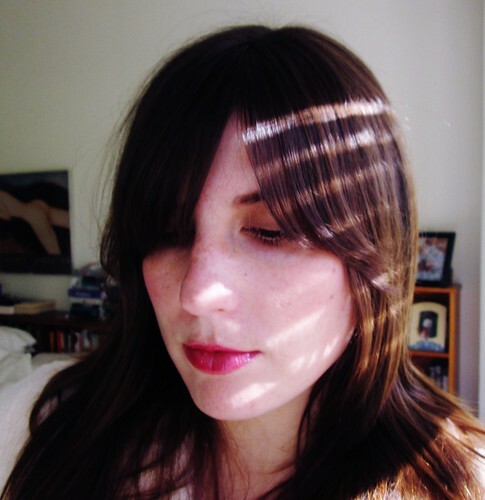 For more from Hannah Cherkassky, check out Fustercluck on facebook.